Digital Rendering of Pull of the Moon: TIME at Coyote Canyon Installation by Bert Benally and Ai Weiwei. 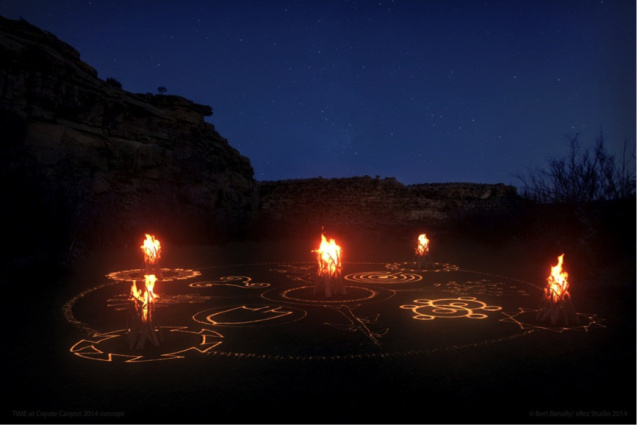 3D Modeling digital landscape is created and produced by xRez Studio Inc.
New Mexico is about to take a bold step into the future of immersive arts. New Mexico Arts purchased a 50′ portable dome with a 3k seamless projection, an artist friendly server system and are creating art that takes dome presentations to the next level in virtual environments. And it doesn’t stop there. The art will be presented as a collaboration of Chinese artist Ai Weiwei; Navajo artist Bert Benally; special effects artists xRez and media artists: Ethan Bach, Will Wilson, Robert Schwan, and Robert Henke along with a documentary film by Daniel Hyde and Blackhorse Lowe. This project entitled Pull of the Moon envisions the future of art to come – collaboration, cultural fusion, natural environment and technology displayed in an immersive dome. Note: This blog post is that of Ethan Bach and is not an official document of New Mexico Arts, TIME, Vortex, MoCNA, Navajo Nation or Eileen Braziel. For more information and the official Press Release, please click this link.